Sayanal is the only plant from RusAl corporation in Russia producing aluminum foil and flexible foil-based packaging. Source: Kommersant. Today Russia is one of the global leaders in aluminum smelting, but Russian smelters – all of which are controlled by Oleg Deripaska’s RusAl, produce nothing more complicated than foil. With its reputation as a major raw materials exporter, Russia’s position as the world’s second-largest aluminum producer should come as no surprise. At the same time, Russia’s continued dominance in this industry is hardly guaranteed. As opposed to oil or iron, Russia has no abundant reserves of aluminum ore. Russian smelters work with alumina produced from African, Latin American and Australian bauxites. There is a domestic bauxite deposit in the Ural Mountains, but the difficulty of mining and the low quality of ore makes it cheaper to import bauxites from Guinea, where they are extracted with surface mining. Additionally, aluminum smelting is a power-consuming process. On average, power costs account for 35 percent of the cost of aluminum. This means that in the future, leadership positions in the industry will go to countries with cheap sources of power – for example, powerful hydroelectric power stations that can be built near aluminum smelters. In Russia, most strategic industrial enterprises were relocated to the eastern part of the country during World War II and the domestic aluminum industry is still primarily located there. One example is the Sayanogorsk Aluminum Smelter, which was built in 1985 near the Sayano-Shushenskaya hydroelectric station in the Republic of Khakassia. Sayanogorsk lies 60 miles away from the regional capital, Abakan. It is a clean town, reminiscent of Moscow residential districts build in the 1970s. A few miles from Sayanogorsk lies an industrial region consisting of three factories constructed next to each other: the Sayano and Khakasia Aluminum Plants produce only aluminum, and the Sayanal plant - foil. The posters and mottos in the plant are near replicas of Soviet models. “New millions of tons of aluminum to the Homeland!”, “Plan is the law, performance is the norm!” and “Our smelts are our power!” read the freshly printed mottos against the backdrop of advanced equipment. According to Anton Savchenko, the managing director of the Sayanogorsk and Khakassia Aluminum Smelters, over 95 percent of the output of the two smelters (836,000 tons a year) is top grade aluminum and alloys. Andrei Lysov, head of casthouse #2, says that the shape and the weight of aluminum products vary depending on customers’ requirements: from 7 kg to 20 ton ingots. More than 80 percent of products are made to order, purchased for production of engineering structures, vehicles, airplanes. Ninety-seven percent of output is produced for export since domestic airplane and vehicle building industries, which use a lot of aluminum, are lagging far behind those in other parts of the world. Above the chair of Gennady Gamanovich, the managing director of the foil-rolling plant Sayanal, hangs a portrait of Oleg Deripaska. By the entrance of the foil formation workshop is a framed portrait with the label: “This person is responsible for your safety.” But the portrait isn’t of Deripaska – the cautionary motto is written above a mirror. Gennady Gamanovich says that the plant’s foil output is between 3,000 and 3,500 tons a month, and 55 percent is exported, mostly to Europe. The plant ensures comprehensive quality control, even inviting a rabbi from time to time to verify absence of animal fats in machinery lubricants. Without his certificate, kosher product manufacturers cannot use the foil for packaging. Gamanovich has even been known to chew pieces of foil to demonstrate the product’s safety and cleanliness. Sayanal is the only plant in Russia producing aluminum foil and flexible foil-based packaging. The plant’s museum features package samples of familiar brands of chocolate, ice cream, drugs and cigarettes. Gamanovich notes that, tobacco manufacturers have started replacing foil with paper in packaging in an attempt to cut costs, but overall, the foil market is growing. China is today the global leader in the foil-rolling sector with around 50 specialized plants. While global prices for aluminum remained relatively high (reaching as high as $3,000 per ton in 2007), Sayanal could survive with outdated technologies. But in 2009, the price dropped to about $1,000. In 2009, primary aluminum output at RusAl decreased only by 11 percent against the 2008 rate. But, as expected, maintaining the output rate resulted in a loss. Smelters around the world went bankrupt. Today, however, demand is once again growing, and the average stock exchange price has been about $2,000 since the beginning of 2012. But even in these conditions, many smelters operate within an ace of unprofitability. RusAl does not disclose the profits and other financial results of individual plants, but, according to the management of the holding, many plants in the group operate at a loss. On the other hand, RusAl is a master at finding cheap sources of power. Additionally, over the last several years it has been solving all of its tariff issues with more success than any other industrial group: in the dispute regarding its Krasnoyarsk plant, the company has managed to overrule the governmental order on supply of expensive power for industrial facilities from interregional distribution grid companies, instead of the cheap power from the Federal Grid Company. Rusal holds a share in Irkutskenergo and thus can provide its neighboring plants with cheap power. 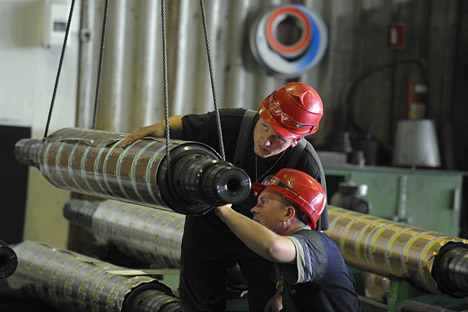 People familiar with the peculiarities of relations between the aluminum and power sectors say that the notions of direct contracts and bulk discounts are not uncommon and as long as water flows through hydroelectric plants, not generating power from it is a loss, and the generated power will have to be sold at a price that the primary customer is willing to pay. And this foundation of well-being for the Russian aluminum sector is unlikely to change.